19.5" x 33" - A Persian Shield is a plant with purple-toned leaves. 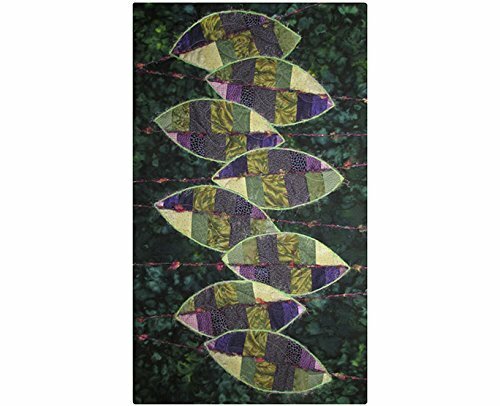 This art quilt features eight leaves made of strip pieced fabrics in purple and green shades. Each leaf has bright green fuzzy yarn couched around it and also a funky dark multi-colored yarn that is couched across the middle of the leaf and extending to the edges of the quilt. It is machine quilted with a purple variegated thread and has a knife-edge binding. It comes with a hanging sleeve and rod, ready to hang on a nail. As shown in the last photo, this quilt can also hang horizontally. If you have any questions about this product by For Quilts Sake, contact us by completing and submitting the form below. If you are looking for a specif part number, please include it with your message.